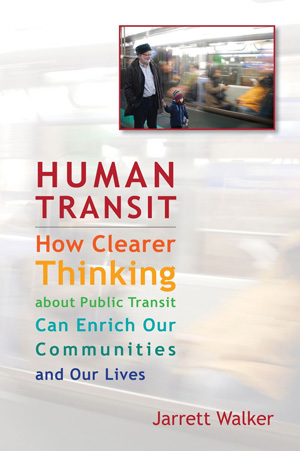 Why the Media Fixation on “Transit is Failing” Stories? Recently, I took issue with the Los Angeles Times for telling a “ridership is falling” story, even as they published a chart that cast doubt on that claim. The chart title contradicts the chart. The transit agency’s ridership has not been in any serious decline since 2005. The truth is that it fell steeply from 2000 to 2005, and had a small drop in ’09-10 related to the financial crisis and related service cuts. Otherwise, ridership has been tracking pretty well with population. The decline comes as new BART service into the South Bay is projected to spill 23,000 more transit riders into the VTA region next year. As their own chart shows, ridership is down since 2000 but up since 2005. The Mercury News is just playing the old arbitrary starting year game. If you want to tell a story about ridership collapse, just pick a high starting year for your comparison. If you want to tell a story about ridership soaring, pick a low starting year. Both kinds of stories are bogus. … that VTA is in a crisis today. No, VTA was in crisis 10-15 years ago, and had a bad year during the financial crisis, when everyone else did, too. 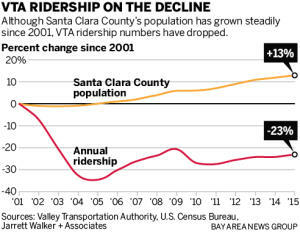 … that VTA is falling behind recent growth in population and jobs. Again, just look at the chart! … that VTA’s supposed crisis is some kind of failure to meet the opportunity presented by the BART extension. No: The BART extension is happening now, the “crisis” happened over a decade ago. … that a ridership “crisis” is forcing VTA’s hand. Yes, ridership is lower than we want it to be, but that’s not because of a “crisis.” It’s because ambitions for public transit are rising as it becomes clear to more people that cars are incapable of serving the region’s growth. When we look at this piece together with Laura Nelson’s recent Los Angeles Times piece, then, the only interesting question is this: Why are newspapers so desperate to tell “transit in crisis” stories? Why is this story what everyone supposedly wants to hear? Why do we see this hysterical spin over and over, even when the very same article contains a chart telling a different story? There’s no doubt that the San Jose / Silicon Valley transit system isn’t what citizens want it to be. That’s why we’re working with the agency. But the issue is not that these agencies are in crisis; it’s that citizens’ expectations of them are higher than they have been in the past. Most transit staffers I know, including those at VTA, spend all their time looking for ways to meet those higher expectations. But if you wonder why transit agencies can sometimes seem defensive, imagine how you would feel if everything you did was slammed in the media using simple distortions like the arbitrary starting year. Would you remain cheerful, open-minded, and ready to take risks for a better world? Chart: San Jose Mercury News, from a chart in our own Choices Report, which is downloadable at the bottom of this page.